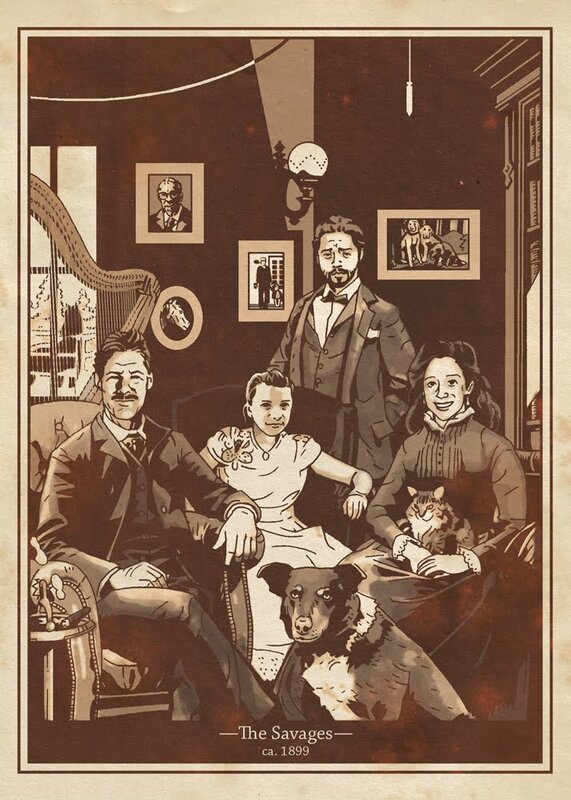 For my mom's birthday on 4/30 I did this Mignola-inspired portrait of my family and pets from Colorado ca 1999, except set back 100 years to the turn of the 20th century. 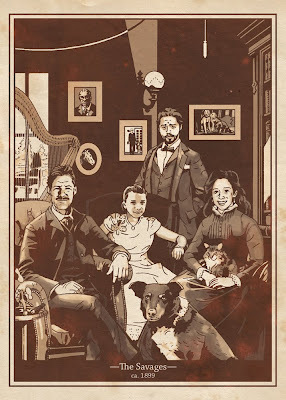 I made a photo composite of various old-timey people and placed my family's heads on it (I also referenced a Mignola cover for most of the background elements). I printed it out in blue line. Drew over it in pencil. No inks. Just scanned it in and cleaned it up. I changed the line art to a dark sepia color. I placed the composite photograph (after I ran it through a filter to blur it up and a sepia photo filter to alter the color) underneath the line art. Then I just eyedropped the tones I wanted and painted over everything. Next I took some paper texture, inverted it, and placed it over everything and set the layer effects to Screen. I flattened all of it. Then I placed another layer of paper texture below the art and set the art layer to multiply. A quick process (I was rushing), and not at all the way I thought I was going to make this piece. The pictures are (from L to R) my mom's father Conrad Lynn (deceased), my mother's white Arabian horse Jasmine (deceased), my father and two year-old me on the day he graduated from naval officer candidate training, and three more of our dogs— Kirby(deceased), her dad Blitz (deceased), and the ornery Isadora (aka Izzy, deceased). The dog front and center is my amazing dog Karloff (RIP), and the cat in my mom's lap is Phil— the only animal out of all of them to die prematurely (she was struck by a car 18 months ago). The Morgan covered in snow outside the window is Comanche, who is doing fine out in Hawaii with my parents. The Savage family loves us some animals. Also, my sister has a Masters in Music, and the harp belongs to her.